An extensive survey conducted by Pew Research Center discovered the differences between consistent voters, drop-off voters, and nonvoters. Drop-off voters those who cast ballots in the 2012 and 2016 presidential elections but not the 2014 midterm were noticeably less engaged in political activity than consistent voters those who cast ballots in all three elections. Generally, drop-off voters tend to care more about the outcome of presidential elections and view congressional elections as being less significant. 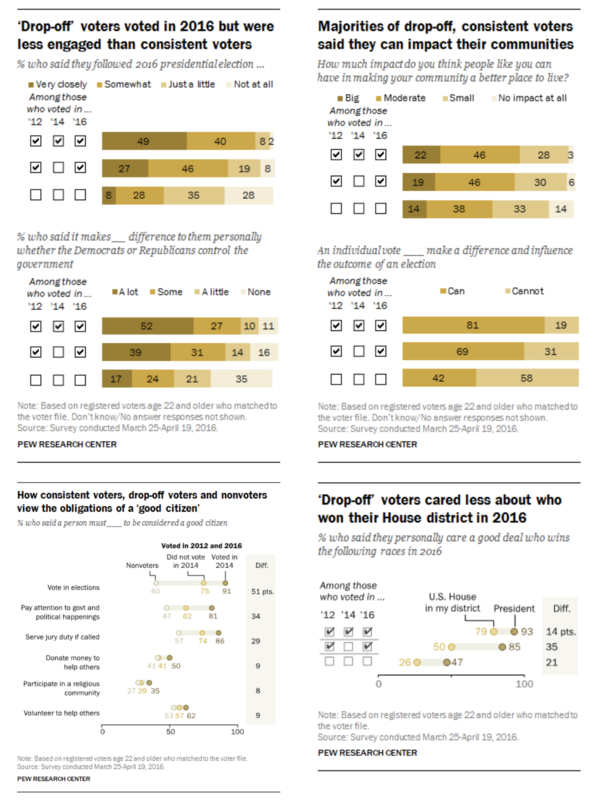 85% drop-off voters surveyed said they “personally cared a good deal” about the 2016 presidential election results, while only 50% had the same sentiment about who won in their own House district. Despite 85% of drop-off voters caring about the outcome of the election, a majority (46%) of drop-off voters reported they only “somewhat” followed the 2016 presidential election. Predictably, a clear majority of consistent voters believe both elections have importance, 93% saying so about the presidential election and 79% about local House elections. On the opposite side of the spectrum, a little less than half (47%) of the nonvoters surveyed cared about the outcome of the presidential election, and only 26% said so in regard to who won the House election in their district. So who makes up this group of drop-off voters? On average, drop-off voters in 2016 were younger than consistent voters. The Pew study based their analysis on people 22 and older, who were old enough to vote in 2012. The 2012 and 2014 US Census reported in the 2012 presidential election, 18 – 24-year-olds accounted for 11.4 million of the ballots cast. That number declined drastically by 59% to about 4.7 million in the 2014 midterm. Additionally, drop-off voters tend to be Democrats or left leaning (58%). In addition to low voter turnout, midterm elections also encounter what’s known as the “Presidential penalty” – or the recurring loss of Congressional seats that the President’s party faces in midterm elections. This phenomenon has been observed in every midterm election since 1876 (with the exception of three years, 1934, 1998 and 2002). The last midterm election in 2014 saw Republicans gain majority in both the House of Representatives (13 seats gained) and the Senate (9 seats gained). There are two main explanations for why the Presidential penalty is a consistent factor in midterm elections. Many voters see midterm elections as a referendum on the President’s performance. This mostly reflects dissatisfaction with the current President’s party, which can be attributed to high expectations or simple ideological differences. Another theory is that voters may favor moderate policies and collectively vote for the opposite party in an effort to divide the government, which will increase the possibility that moderate policies are enacted. What does this mean for the 2018 midterm election? The Voter Participation Center predicts a drop-off of about 40 million votes, nearly 200,000 in Kansas alone.